Güveç is the name of a variety of earthenware pots used in Turkish cuisine, and of a number of casserole/stew dishes that are cooked in them. The pot is wide medium-tall, can be glazed or unglazed, and the dish in it is cooked with little or no additional liquid. Güveç dishes can be made in any type of oven-proof pan, but clay or earthenware pots are preferred of the heady, earthy aroma they impart to the stew. From Turkey it has spread throughout the region, with slight variations on the name. The names of the dish Đuveč in ex-Yugoslavia, Gyuvech in Bulgaria and the Greek dish Giouvetsi derive from güveç, although they are not always cooked in earthenware güveç pots. 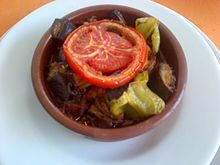 The Turkish, Romanian and Balkan oven-baked meat and vegetable stew similar to ratatouille is called by various names including güveç and đuveč (Turkish: güveç, Bulgarian: гювеч, [ɟuˈvɛtʃ], Bosnian: đuveč, [ˈd͡ʑuʋɛt͡ʃ], Macedonian: ѓувеч, [ˈɟuvɛtʃ], Serbian: ђувеч, [ˈd͡ʑǔʋɛt͡ʃ], Romanian: ghiveci, [ɡivet͡ʃi]). It is made with meat, olives, tomatoes, mushrooms, onions, herbs, and spices and is often served with "Balkan mixed salad", a combination of roasted eggplant, sweet peppers, garlic, tomatoes, and vinegar. Meats can include chicken, pork, lamb or sometimes beef or fish (or the meat can be omitted), while vegetables may include onion, tomatoes, peppers, zucchini (courgettes), eggplant, peas, potatoes, carrots. The dish is flavoured with paprika and summer savoury and various other herbs, and may be cooked in a pan or in the oven. The name đuveč, an earthenware casserole in which đuveč is traditionally prepared, comes from the Turkish güveç "earthenware pot". ^ Wolfert, Paula. Mediterranean Clay Pot Cooking: Traditional and Modern Recipes to Savor and Share. Wiley. p. 133. ^ a b "Güveç is a satisfying meal that is surprisingly easy to make". Zaman. December 22, 2008. Archived from the original on September 4, 2015. ^ "Serbian casserole (đuveč)". The Serbian Cookbook. Retrieved 17 December 2015. This page was last edited on 5 October 2018, at 05:30 (UTC).